There are so many merchants who have created their online stores with the help of Magento and they are absolutely satisfied with its features and easy handling facilities. The Magento PHP e-commerce application offers all necessary features that would increase the capacity and capability of your business and would make the inspection even easier. There are so many Additional features offered by Magento but what are the mail features that made it so popular worldwide? • The Magento has so many rare features, and it is a bunch of useful features. So, a shopper would never feel the lack of any feature in this PHP E-commerce application. This becomes high competition for other competitors because user friendliness and feature fullness are all that an online merchant needs. 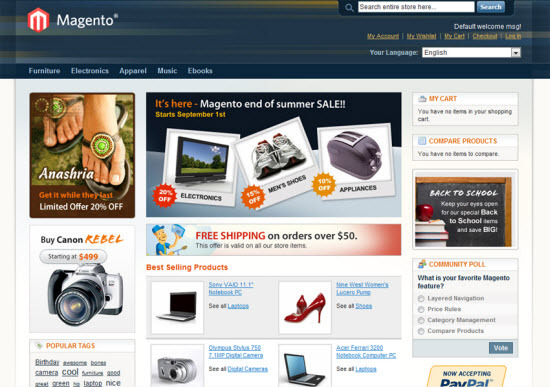 • The Magento offers so many general and advanced features in its built-in. It provides Advanced and modifiable search for your online store so that users can easy reach what they need. It offers easy and quick layout navigation system that would be easy for setting up or modifying your online shop. • Additionally, it provides wish lists for your store with multi store facility. It also allows you to do basic or advanced product comparison for the satisfaction of your customers. • It would provide you list of registered email accounts so that you can easily identify the registered profile. • The Magento is said to be the best solution for Static pages group or product group because it all can be handled with Magento content management system. • The Magento codes are well defined and perfectly explained and described. Because of it, it is easy to integrate any other third party code for even more features for your online store. It perfectly describes the starts and end and reason of all codes and that is why it is the developer’s choice too! • As it is well defined and well coded, it allows the easy integration of other modules and extensions for your online store and the impact would be good and it would not affect bad on your future upgrades, and the basic structure would remain same for updates and upgrades. • There are so many online merchants who are switching their online store to Magento because of its outstanding and easy features with flexibility and freedom of creativity. • It is the stand alone application that can be easily integrated anywhere with the help of extensible API. This will make Magento perfectly according to the hosting server, and it would provide email list management tools, external accounting systems, ERP systems, and many additional features. It simply work with all browsers and all servers that would give you and your customer extra functionality feature. • Magento is wide community where users and developers have taken a part in its progress, and so many developers have appreciated its code friendliness. The Magento provides easier and quicker professional help from the team of Magento service providers and experts. • Magento has a large number of no-cost and commercial extensions that are specially designed for integration with your online shop for advanced functions. It allows the shop customization in numerous ways. • Most important thing that popularity of the website need is SEO Friendliness, and Magento is a SEO friendly PHP e-commerce application. It would drag you to the top with fewer efforts for search engine rankings. For advanced shoppers, it allows you to input your own selected Meta tag, XML code, Title, and Keywords for your every single product and other category pages. • It is completely PHP based platform, and that is the reason why it gives the facility of quick page processing and loading. Even the additional features extensions would not slow down your web shop. • It is fastest growing and successful web service that has vast online community of talented peoples. • Almost 90% of Magento users appreciate its functionalities and user friendliness features. There is no end of features and additions in Magento. Only famous and most praised features have been described here, but Magento offers much more for your perfect and convenient online shop. It would allow you to create you online shop quickly with less integration and customization because Magento already provide ready to start shop, but you would get full freedom to do any more customization according to your need. It is said to be best for programmers and for general merchants because it is a full package of easy to use and customizable flexible PHP e-commerce application. If you have any additional question or suggestion then you can visit the official Magento website, and you can get more details about the Magento platform there by their experts. Numerous peoples are using Magento PHP e-commerce application and availing the benefits, it is your time to start the new future with Magento the best PHP e-commerce application. Author bio: Adrian is a web designer who works in a reputed firm – http://www.peexl.com. He love using Magento platform and Magento extensions for building good websites for his clients. He also writes a personal blog where he shares his personal experiences about his life and business.